And The Women Who Tamed Their Hearts. This series tells the stories of the seven sons of William Henry and Aurelia Randolph. William Henry was an abusive, alcoholic womanizer who wasted the family fortune and put a serious blot on one of the most respected names in Virginia history. His friends and family got together and bought him a ranch in Texas just to get him out of Virginia. Aurelia was a beautiful woman who worshiped her husband but was too weak to protect her sons from his brutality. The series begins in Texas after the end of the Civil War when the older boys come home. They must fight to save their ranch, their only inheritance, from Indians, rustlers, and the officials of the Reconstruction. George Randolph, the oldest brother and patriarch of the family, needs someone to wash, cook, and clean for the brothers on their Texas ranch. Rose Thornton accepts that job. She arrives at the homestead to find six men ranging in ages from six to twenty-four years old. The house looks like it hasn't been cleaned in years, the clothes practically stand up and beg to be washed, and everything in the kitchen is black with soot and grease. She soon discovers she's in the midst of a truly dysfunctional family. The brothers don't seem to like anybody, and that includes each other. They don't much like Rose, either. Once they learn her father was an officer in the Union Army, they vote to send her back to town. George Randolph was an officer in the Confederate army. He feels responsible for his family, but wants to rejoin the army, the only time when his life was ordered and predictable. Rose sets out to convince George that he's not only a father figure to his brothers, he really wants a family of his own. With her. At the same time seeks ways to repair the fragile bonds that hold this family together. "ROSE is a nongenre story with a uniqueness that truly sets it apart. And the author is a dynamo of a storyteller whose major strength is his liberal use of quick-witted dialogue." "Here come the brides. Kick up your heels and get set to enjoy a big, boisterous romance. 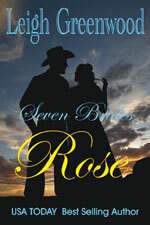 ROSE is the first delightful book in Leigh Greenwood's Seven Brides for Seven Brothers series. It's fun, exuberant, entertaining with a special charm and poignancy of its own." "ROSE is fun, exuberant, entertaining with a special charm and poignancy of its own. If ROSE is any example of the strength and power of this series then readers will have six more wonderful books to enjoy in the future." “This one zings with exciting, believable characters, plot development and sexual tension plus the promise of more books about the rugged, romantic Randolphs. Don't miss the beginning of a memorable series (that's) sure to catch your heart strings as it did mine. "Each of these brothers deserves a story of his own, they've earned their own loves and lives... These are characters you lock within you to keep for a "down" day and take them out to cherish." "Leigh Greenwood has created a powerful family saga that showcases an exciting dynasty in the making. Even though the readers will be totally caught up in the believable relationship that evolved between the hero and heroine, a piece of their hearts will go out to the remaining Randolph brothers. Fern Sproull, a young, swaggering opinionated ruffian, dressing and behaving like a cowboy, is determined Hen Randolph will hang for killing her cousin. She's equally determined that a fancy lawyer named Madison Randolph isn't going to get his brother off. Fern has spent the last eight years of her life outriding, out shooting, and out cussing every man in her path, and she's not about to let the man who murdered her cousin get off just because he's one of the Texas Randolphs. But how is she going to know what tricks Madison gets up to unless she follows him around? Madison Randolph, the brother who abandoned his younger orphaned siblings to go to Harvard during the Civil War, has come to Abilene, Kansas to defend his brother against a murder charge. There's not much love lost between Madison and his family, but he's certain Hen isn't a murderer and he doesn't mean to let him hang. The fact that an obnoxious female who dresses like a man and acts even worse intends to stop him only encourages him to prove he's the very best at what he does. The suave, sophisticated Madison is appalled, first to discover that under all that dirt and bluster is a woman, and secondly, that he's intrigued by her. But Madison soon discovers the female isn't so obnoxious after all and that the ties of blood can never be broken. "I loved ROSE, but this one is even better. Its masterful, in-depth study of a man's burning ambition and bitter shame is so provocative and true to life, I couldn't put it down and will remember it always. Leigh Greenwood's books just keep getting better and better." "This is an outstanding story of the prodigal son, Madison, who finally comes home, and the lady who can light the homefires and keep them burning. Gentle persuasion, rough-housing vitriolic verbiage, and passionate loving, stirred with the tender, loving pen of Leigh Greenwood present the reader with an unforgettable high-caliber read!" "Fern is absolutely wonderful, an unforgettable, powerful, and emotional love story to stir your heart and soul. Leigh Greenwood's series was off to a great start in ROSE and continues to shine in FERN, a story that leaps off the pages." Monty Randolph plans to take a herd to Wyoming. He means to start a ranch for the family and one for himself so he can get out from under the irritating and watchful eye of his older brother, George. He's determined that nothing will stop him from succeeding, especially his neighbor, Iris Richmond, who wants him to take her herd to Wyoming along with his. The last thing he needs is a southern belle, steeped in flirting and vanity, on the filthy, exhausting trek over a thousand miles of dangerous, unsettled country. Her kind is strictly for looking at, not for buying. Neither does he need double the cows and double the responsibility. He already as three brothers along to worry about. Iris Richmond has nothing left of her father's fortune but a herd of cows. And if she doesn't get them to Wyoming, rustlers are going to take that. When Monty refuses to take her along, she puts her herd on the trail ahead of him and mixes the herds together. The continual danger of stampedes, rustlers, and Indian attacks drive the couple together, forming a relationship neither welcomes nor is able to deny. Beset by a thieving foreman and a long lost brother, Monty is the only person Iris can trust. And she means to trust him whether he likes it or not. "IRIS is a strong multi-dimensional novel that not only examines the growth of a meaningful relationship but does it with sensitivity towards both the hero's and heroine's perspectives. The character depth and portrayal in this work is nothing short of remarkable." "IRIS is another utterly delightful, heartwarming romance and another special addition to readers' keeper shelves. 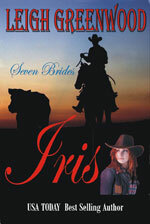 IRIS is a dynamic combination of a wild western trail ride and a charming Americana romance. Leigh Greenwood's memorable characters work their way into your heart. I'm sure you will come to love them as much as Rose, Fern, George and the rest of the unforgettable Randolph clan. Here's to another winner!" Hen Randolph's reputation as a cold-hearted gunslinger without a need for friends, family or women, was the reason he was hired to be the sheriff of Sycamore Flats, a small Arizona town. They needed someone ruthless enough to protect them from the Blackthornes who have harassed the town and run off the previous sheriffs.. When he saves a young widow. Laural Blackthorne, from a beating, he finds he's made a enemy of the entire clan. When he refuses to let the Blackthornes take Laurel's son, they plan to kill him and warn the townspeople to stay out of the way. Laurel Blackthorne has no need for gunslingers or guns. As far as she's concerned, Hen is no different from her late husband or his family. She wants little more than to prove she was legally married to Carlin Blackthorne and that her son is legitimate. She doesn't want the new sheriff to interfere. But when he does and carefully tends her wounds, she sees the tender man this gunslinger could be. But Hen is a loner who thinks he's empty inside unable to love and certainly not worthy of anyone else's love. She loves him but can't let herself hope for a future with him. As a sheriff, he would always be in danger, and she can't stand the idea of losing him. When he says he intends to face the entire Blackthorne clan alone if the town refuses to stand behind him, she can't decide whether he's a saint or a fool and starts to leave town. She doesn't get very far before she decides having a man be a fool over her isn't half bad. "WOW! What can I say but magnificent, superb, wonderful, and captivating. The characters are so true to life, I feel they are personal friends of mine." "This is a wonderful story about a cold, unfeeling town awakened to its responsibility, and how they learn to accept people for what they do, not what they or their parents did or didn't do. I really enjoyed this story. This is a must-not-miss series. Great reading." While Tyler Randolph is prospecting for gold in New Mexico to get the money to build the hotel of his dreams he finds a woman wounded and left to die in a blizzard. He can't take her into Albuquerque because he doesn't know who's trying to kill her, so he takes her to his cabin. When the killers come after her, he makes it his job to protect her. Tyler is a loner not used to have a woman around. He's very self-conscious about his tall, lanky body and the fact that he isn't handsome like his brothers. Daisy Singleton has no idea who killed her father and tried to kill her, or why. Awakening with a head wound in a strange man's cabin, she doesn't know whether to be afraid or angry. Being stranded in a mountain cabin with a silent, kind, bossy, bear of a man is frustrating. She just wants to go to Albuquerque and stay with her friends, but Tyler won't let her leave because he still doesn't know who's trying to kill her. When Daisy tells Tyler she's engaged to be married, he hustles her down the mountain. Although Daisy stays with Hen and Laurel and Tyler returns to this mine, their story isn't finished. There remains a killer to unmask, Daisy's independence to establish, and the need to learn the truth about their feelings toward each other. 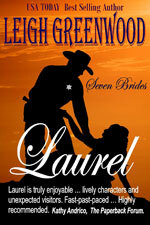 "Leigh Greenwood has created characters in the Seven Brides series who are as close to you as your own family. 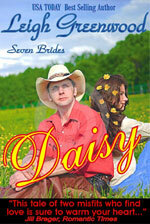 Daisy is a tender, touching love story. The characters reach out and touch you. This tale of two misfits who find love is sure to warm your heart. Fans of the series, as well as new readers, will find this a "not-to-be-missed keeper." Jefferson Randolph is angry at the world for the arm he lost in the War Between the States and the destruction of his family. Embittered and reclusive, he's certain he'll never be happy until he marries a true Southern belle and rebuilds his family home. The last person he expects to stand in his way is a fiery redhead from Massachusetts who is the housemother for his two mischievous nieces, the stereotype of everything he detests in a woman. She's a Yankee who refuses to defer automatically to men, she has opinions she holds to firmly and states loudly, she wears strong bright colors, and she is determined to be independent. He's furious that, even after the quarantine is over, he can't stop thinking about her. 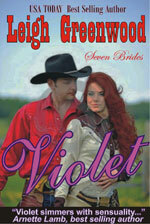 Violet Goodwin has come west to discover what happened to her uncle and why the mine he left her is worthless. To support herself, she's taken a job as housemother in an exclusive girl's school. After Jeff Randolph is quarantined in the school with her and her sixteen young charges for five days, she wonders how she can be attracted to a man she dislikes so much. He appears to be self-pitying, angry, and emotionally distant. She can't understand why she could fantasize about him though she can't deny the man's physique is impressive. She hardly notices his missing arm, but she is stingingly aware of his ridiculous ideas about women. She's determined to prove that you don't have to be a young, mindless, southern belle to make a good wife. "All of the elements are here a strong, patient heroine, a troubled, stubborn hero, and an endearing love story. Beneath Jeff's prickly exterior is a man waiting for the right woman to come along. The refreshingly original plot held my interest throughout. Zac Randolph owns and runs the Little Corner of Heaven Saloon in San Francisco's notorious Barbary Coast. He's a gambler by trade and by nature. He takes care of the girls who work for him, but no woman is as exciting as gambling, no woman means as much to him as his saloon. His life is perfect until a distant cousin, Lily Sterling, arrives from Virginia and upsets everything. Taking Zac up on a casually extended invitation, this fresh-faced beauty has fled her father and a prospective husband. She insists she doesn't want Zac to take care of her, but Zac is as good-hearted as he is selfish. He knows Lily is too innocent for San Francisco. When he can't convince her to go back to Virginia, he tries to find her a safe job. But Lily's good-heartedness continually gets her into trouble from which Zac has to rescue her. When she is caught in his bed, compromised (she wasn't, but nobody's going to believe two nearly naked people), an immediate wedding was the only solution. Lily was more than happy to believe Zac loves her, but Zac is determined to stay away from Lily so he can leave her with a clean conscience. Lily sees only the good in Zac and believes she's been sent to San Francisco to save him from himself, but Zac is determined to get Lily away from the saloon and out of his system. He should have known by now that where there's a "flower woman", there's a Randolph about to lose his heart. "LILY? Sensitive, stylish, irresistible. Leigh Greenwood at his considerable best." 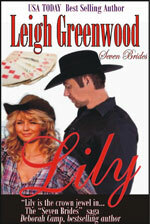 "LILY is the crown jewel in a collection of gems penned by Leigh Greenwood. 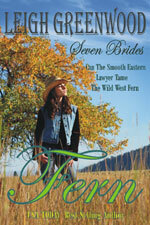 His powerful "Seven Brides" saga will be read and enjoyed for generations." "If ever there was a happy-ending book, this is it. LILY has romance, intrigue, and especially humor with some very lovable characters. Its plot is simply wonderful. This book will capture readers' hearts, making them believe love is possible for everyone.